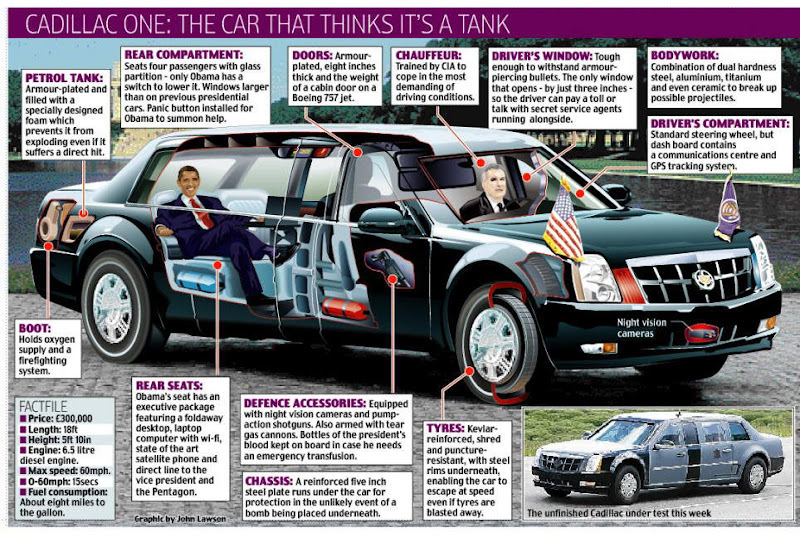 It's official call sign is Cadillac One, but it will always be known as the Obamobile. But his Secret Service agents have already been familiarizing themselves with the machine they call 'The Beast', built by General Motors in Detroit and based on a Cadillac chassis. The company refuses to give precise details of how it will perform its primary purpose - protecting the president. But bulletproof glass and armour plating are standard throughout and the car is hermetically-sealed to withstand chemical weapons. As with previous presidential limos it is packed with electronic communication systems to allow Mr Obama to keep in contact with the outside world. One personal touch will be the remote-controlled ten-CD changer on which he can play his favourite artists, said to include Stevie Wonder and Bob Dylan. Despite the protection afforded by Cadillac One, the Secret Service will be taking no chances when Mr Obama is sworn in as the 44th president. A three-mile security perimeter will be thrown around the U.S. Capital, with no vehicles allowed inside, to prevent a car bomb attack.